Medical Device Standard Operating Procedure Templates- Describes the systematic approach used to collect and analyze information, identify and investigate product and quality issues, and take appropriate and effective corrective and preventive action to deal with product and quality issues and prevent their recurrence. This procedure also discusses the communication and documentation activities associated with the corrective and preventive action system. Package consists of the procedure, a Corrective and Preventive Action Report form and a Corrective and Preventive Action Report Log. Medical Device Standard Operating Procedure Template- Describes instructions for performing servicing of finished, distributed medical devices and verifying that the serviced devices meet specified requirements. Package consists of the procedure, a Service Report form, and a Service Activities Log. Medical Device Standard Operating Procedure Template- Describes the requirements and process for determining whether a product recall, field correction, or removal is reportable to the FDA and to define the reporting requirements for such actions that are initiated by the company. Package consists of the procedure, a Recall Action Report form and a Recall Action Log. Medical Device Standard Operating Procedure Template- Describes the procedure for the mandatory reporting of adverse events and product problems to the FDA in accordance with the FDA's mdeical device reporting requirements. 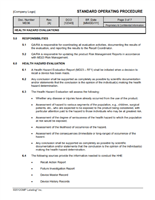 Package consists of the procedure and a Medical Device Report Log. Medical Device Standard Operating Procedure Template- Describes the process for receiving, reviewing and evaluating complaints and describes the responsibilities associated with the complaint handling process. This procedure also describes elements of the customer communication and feedback process. Package consists of the procedure, a Complaint Report form and a Customer Contact and Complaint Log. Medical Device Standard Operating Procedure Template- Describes the process for performing and documenting effective failure investigations as a result of a non-conformance, corrective and preventive action, complaint, adverse event, or other quality problem. Package consists of the procedure, a Quality Investigation Report form and a Quality Investigation Report Log. Medical Device Standard Operating Procedure Template - Describes the process for performing and documenting a Health Hazards Evaluation. Package consists of the procedure and a report form.